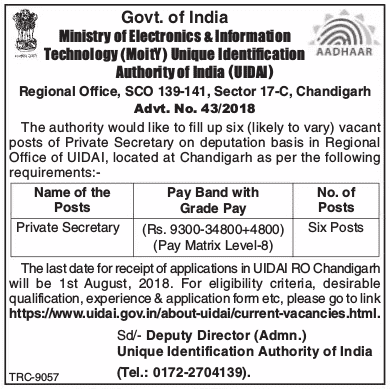 The Unique Identification Authority of India (UIDAI), has recently given a notification of 06 Private Secretary Jobs on the deputation basis in the Regional Office, Chandigarh. The interested candidates can apply for the UIDAI Chandigarh Recruitment 2018 on or before 01 August 2018. Aadhar Card Recruitment 2018-19 notification is out. As per the Notification, there are 06 Private Secretary Vacancies. The educational qualification is as per the UIDAI norms. The maximum age limit for Private Secretary Vacancy is 56 years. If you are looking for Private Secretary Jobs in Chandigarh Aadhar Card Department then this article is going to be very helpful for you. Holding analogous post in the pay matrix Level-8 (pre-revised Pay Band – II, Rs. 9300-34800/- plus Grade Pay of Rs. 4800/-). The candidates should have good stenographic and typing skills. Proficiency in handling computers with excellent computer skills. The maximum age limit is 56 years as on the closing date of receipt of application. You can send your application along with the relevant documents to the ADG (Admn. ), UIDAI Regional Office (RO), SCO 139-141, 3rd and 4th Floor, Sector 17-C, Chandigarh-160017 on or before 01.08.2018. Last Dates: 01 August 2018. Aadhaar Card Chandigarh Jobs 2018 – 19 notification is out. As per the Notification, there is 01 Assistant Accounts Officer vacancy. The educational qualification and other requirements are stated below. The age limit is 56 years.